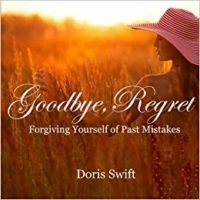 Doris Swift is the author of Goodbye, Regret: Forgiving Yourself of Past Mistakes. She loves to write, teach, and encourage. She reaches out to a community of women through her blog Walking Deeper at www.dorisswift.com, at speaking events, and on her Walking Deeper Facebook page. As a leader in women’s ministry, her passion is to share God’s truth and disciple women to grow in faith as they follow Jesus. In ministry for over thirty years, she has been gifted to teach, speak, mentor, and counsel. It’s her joy to see women of all ages bloom in their purpose and calling. She’s written for various sites and publications such as Purposeful Faith, (in)courage, and Just Between Us magazine. Doris resides in Florida with her husband Brian. She enjoys traveling to historic cities, spending time with family, and loves being Gammy to her beyond adorable grand-kids. You’ll find her on the soccer field, rain or shine.